Android privacy: is it a joke or the punchline? 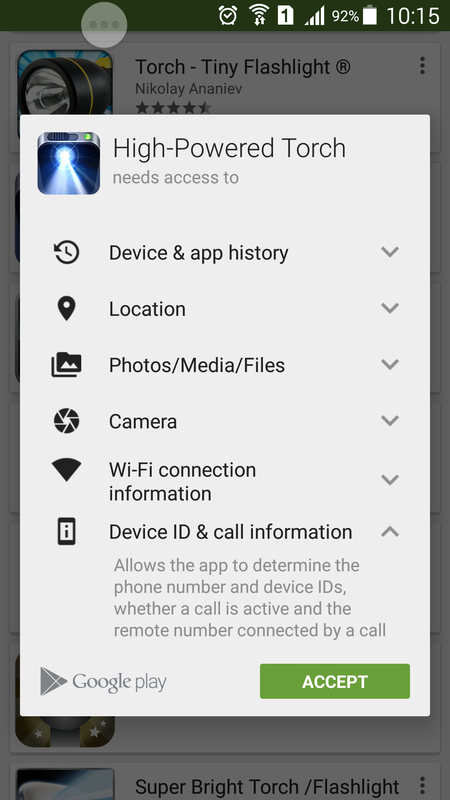 This torch app “only” requires access to your personal files, phone calls, location and identity… and of course the actual camera flash itself, which seems like more of an afterthought. Google have actively tried to obfuscate the extent to which they allow their own and 3rd party software to violate privacy of Android users. I use the Facebook apps as an example here, but there are plenty of other widely-used invasive apps around (Google’s own in particular). This survives the same way that Apple products do, given their terms and conditions… Users either don’t notice the invasive terms that they’re agreeing to, or they don’t realise the consequences of them. Even if you don’t install these malicious apps, your communications are insecure. If any of the people who you communicate with have a spyware-laden app, it can see both sides of the conversation between you and that person. Android/iOS privacy violation operates in a similar way as herd-immunity, but for the worse instead of for the better. By free open-source mods and ROMs (e.g. Cyanogen)? Plenty. 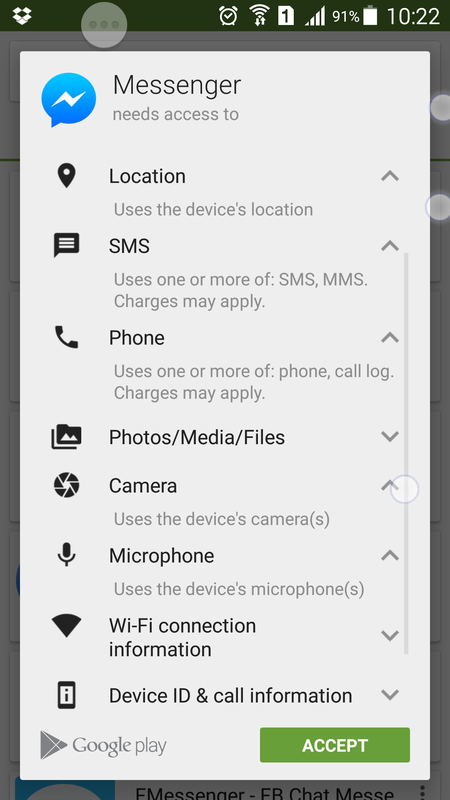 The Xposed module “App Settings” allows one to revoke permissions from an app, often causing it to crash when it attempts to use that permission. This is an “opt-in” security measure in the sense that one must actively revoke the permission after installing the app. As an anecdote, when revoking Facebook Messenger’s ability to monitor the screen contents, I noticed that Messenger would crash (“Forced Close”) whenever I opened a WhatsApp conversation. This was before Facebook bought WhatsApp of course. But the problem is that security and privacy are still on an opt-in per-app basis. By default, our system allows malicious spyware and trojans to act as soon as we hit “install”, then we must manually disable them afterwards. Disabling them may also cause the app to crash frequently, making the part of it that’s actually useful now inaccessible. What we need is an inversion of control – instead of the permissions being “All or nothing” on installation and “Access all areas unless I stop you” afterwards, we need to give full control back to the user. Ideally the user decides what permissions they’re happy with any app being able to use, and therefore which permissions are “private”. When an app attempts to conduct a “private” activity, then it receives mock data rather than an exception – so instead of crashing the app, it simply receives false information. If we decide that an app should be able to access some “private” area, then we manually grant it permission to get the “real” data instead of mock data – now private information is “opt-in” instead of “opt-out”, and the security is “opt-out” instead. We could take this further by allowing a timeout on the private information “opt-in”, so we could allow Facebook access to our location information for the next 30 minutes, and have it automatically disable afterwards. So if “location” is amongst our list of “private” permissions, then when Facebook requests our location it gets mock data – we could be atop K2 for all Facebook knows (although IP geolocation would eliminate this somewhat…). When it requests access to our phone calls or SMS messages, it gets fake data. If it requires access to messages to validate our number or device, then we can grant it access to new messages only and only for the next 5 minutes, then have it automatically receive mock data again after that. This entry was posted in Hack, Software and tagged android, android privacy, data, dependency injection, facebook, google, information, inversion of control, mock data, personal, personal information, private, violation on April 7, 2015 by Mark K Cowan. While travelling around Europe (and now, living in Estonia), I occasionally want to connect to my home PC in order to backup photos to it from my camera, or to copy music from it to my phone. Unfortunately my PC is at the family house (now that I don’t have a UK house) and they have a crappy ISP router which “forgets” its settings every time the ISP pushes some new pointless stealth update to it. The dynamic IP problems arising from the cheap ISP are easily resolved via my Dynamic DNS package, however that isn’t even necessary for the solution in this article. This means that my PC in England essentially cannot receive connections from the outside world. However it can make connections. This is where “port backwarding” or rather “reverse port forwarding” comes in. In typical port forwarding over tunnels, you connect to some other device and messages sent to some port on your end are forwarded down the tunnel to the other end. In a reverse port forward, you connect to some other device and instruct it to forward packets back down the tunnel to you. When my PC is powered on, a service loads which creates a tunnel to one of my cloud servers. On the remote end of this tunnel, a port on the server is forwarded back down the tunnel to my home PC. Therefore, connections made to that port on the server are forwarded down the tunnel to my home PC. Hence, my home PC can receive connections from the outside world, as long as they are passed through the tunnel that it created to the outside world. This is similar to a VPN, but much simpler and also quick and easy to configure. In order to prevent me from having to enter a password for SSH login every time the service starts, I use public key authentication*. If security is not an issue, you can also create port forwarding (reverse and forward) via netcat and pipes. * I actually use this between ALL my secured PCs and servers, and disable password login. This vastly reduces the risk of Chinese botnets getting into my networks. The server hosting this blog (and others) gets on average three failed login attempts per second from China, plus some from other parts of the world too. An IPTables rule-set restricting connection initiation rates on certain ports also hardens security against these bots somewhat. First, to power my PC on remotely, I issue a command to one of my cheap cloud servers. A service running on a Raspberry Pi in the England house creates a connection to my cloud server. The cloud server uses this connection to notify the Pi when a “power on” command is received by the server. The Pi uses Wake-on-lan to power my PC on – much cheaper and simpler than the 1980’s power-relay method. My PC powers on and the “port backwarding” service starts. This method does not require a VPN or my Dynamic DNS service. Nor is my old remote wake-on-lan interface needed any more. which listens for packets via local loopback, port 9000 on the remote host, and forwards them over the tunnel to local loopback, port 22 (SSH port) on the home PC. But I see no advantage in forwarding through the Pi, and it will definitely slow things down a little. Also if I decide to reboot the Pi then I would lose my connection to the home PC via this method. which creates an SSH connection through local loopback to port 9000 – which is forwarded over the previously-created tunnel to my home PC’s SSH port (22). If I bind the tunnel to the public IP of my server, then I can connect to my home PC from my SSH client here, rather than logging into my server first. Obviously, change the user-names and server names/ports to your own preferred values, I use home-user/cloud-user/cloud-server/9000 as examples here. This entry was posted in Hack, Linux, Networking, Software and tagged firewall, nat, port backwarding, port forwarding, remote access, reverse port forwarding, reverse proxy, reverse tunneling, reverse tunnelling, ssh, ssh proxy, ssh through nat on June 23, 2014 by Mark K Cowan. Use this link to post Facebook updates via “a potato”. If size matters then you’d obviously rather post your status update via a watermelon. For the more steampunk people out there, you can send your status updates via a carrier pidgeon! Then when you’ve posted it and you’re back here, why not use this one to leave the site? Or alternatively, use this one if you’re smarter and can spot an obvious rickroll. 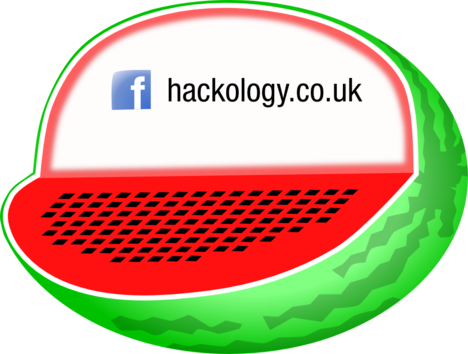 This entry was posted in Hack and tagged a potato, facebook, potato, via, via a potato, watermelon on January 6, 2014 by Mark K Cowan.